‘Giovanni del Violoncello’ was the contemporary nickname awarded to the now-forgotten 18th-century Italian cellist-composer Giovanni Battista Costanzi (1704‑78), giving us an idea of the reputation he enjoyed in Rome as a household musician for Cardinal Pietro Ottoboni, Vivaldi’s famous patron. Another illuminating informational titbit is the fact that he taught Luigi Boccherini. However, neither of these contextual nuggets is mentioned in the almost opaquely academic notes to this premiere recording of seven of his cello sonatas, which seems a shame, but the musical programme itself is truly engrossing, and cellist Giovanni Sollima should be applauded for his decision to investigate, and essentially rescue, these works. Joined by fellow cellist Monika Leskovar and the Arianna Art Ensemble, Sollima presents five solo sonatas with continuo and two for two cellos. Their composition date is unclear, but the real take-home point is that Costanzi clearly wasn’t known as ‘John of the Cello’ for nothing, because the stylistic and virtuosic variety is extraordinary to the point of feeling experimental: think surprise dynamic shifts, frequent high-register writing, rapid runs and broken-chord passages; technical effects such as swoops, flourishes, and dropping the bow on the strings and letting it bounce. The G minor Sonata’s Allegro showcases pretty much all of the above over the course of a mere four minutes. The (studio) recording itself captures all the above with a vivid sense of immediacy. Engineering-wise, the solo cellos are right up-close. Performance-wise, the tone produced by Sollima on his 18th-century Venetian instrument has a slightly ‘dirty’ quality, heavy on energetic panache, which perhaps won’t appeal to everyone but is certainly dispatched with wizardly skill. 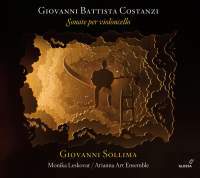 The recital then ends with a fun new work by Sollima himself, inspired by Costanzi and melding the most colourful elements of Baroque style with contemporary harmonic freedom.